In harmony with the below announcement, Equipd has been removed from the App Store and is no longer available for download. Please do not email asking for alternate methods of download - there are none, and even if there were, the reasons for removing Equipd from the App Store would still apply. January 1, 2015: It turns out that removing an app from the App Store does in fact leave it available to existing users to re-download from their "App Store > Purchases". Which is handy. I still encourage users to follow the instructions below for the safest way to backup and restore the app moving forward. June 26, 2015: An update has been posted to fix issues with changes on WOL. Also a new Bible app released. Read more here. This is an important announcement with regard to the future of Equipd. It has been an absolute pleasure developing Equipd and assisting so many brothers and sisters around the world. I hope you have benefited from Equipd over the past 2 1/2 years and wish you all the best in your continued zealous efforts serving Jehovah. I encourage you to carefully read the questions and answers below. When and how will Equipd be shut down? I will push one more update to Equipd (version 3.4.1) that includes details of this announcement. I am still finalising this update, including translating the strings across all of the languages Equipd is supported in. Once I have submitted the update, and Apple has approved it, Equipd will remain on the App Store for a number of weeks to ensure most existing users get this final update and are fully informed of this important change. I thus anticipate removing Equipd from the App Store towards the end of December. Please encourage your friends to update as soon as possible so they do not miss out. Can I continue to use Equipd even after it is removed from the App Store? Will you continue to support Equipd? I will continue to do my best answering questions and supporting users for the foreseeable future, although I will direct most support requests to these online Support Forums. Will we continue to get the new magazines and OKM updates in Equipd? I will keep pushing through the language updates for a number of months into the foreseeable future. I cannot state for exactly how long, but ideally long enough to equip users until they have another tool they can use to meet their requirements. Note: As promised I have continued to push updates to publications. if your Equipd is not updating with the latest publications, either your language has not received any updates on WOL yet or something is not quite right on your copy of Equipd. There is no need to email me - this is all covered in detail here. 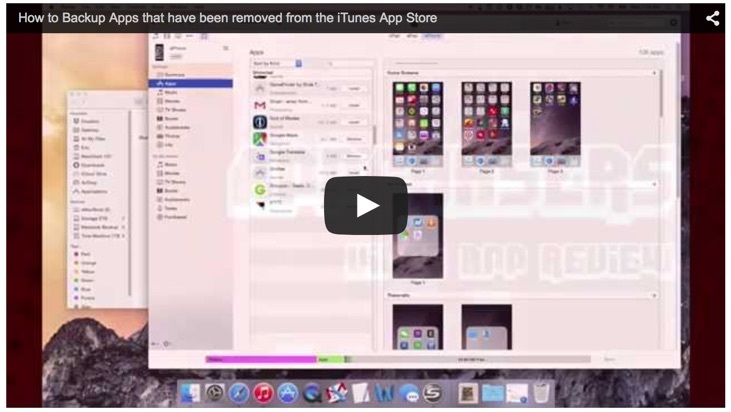 Will existing users be able to reinstall Equipd from the App Store? This is an extremely important question. I cannot guarantee you will be able to reinstall Equipd from the App Store once I have removed it. Your should install Equipd via iTunes if you have backed up Equipd to your desktop or laptop computer using iTunes at some point. So - please backup your device using iTunes and transfer your app purchases. This will ensure you have a copy of the "Equipd.ipa" file on your computer so that you can install it on a new device, or reinstall on existing devices if needed in the future. You can read about how to transfer app purchases to your computer here under the subheading "Transfer your purchases to your computer". UPDATE: I also highly recommend a video tutorial that has been made on AppChasers to help Equipd users! Check it out here. Does this mean the end of you providing ministry tools? Absolutely not. This is the end of Equipd in it's current form. But I still have plans to implement tools that equip users in lots of ways - but obviously without breaching copyright. I may even re-release Equipd in a different form at some point. Please do not pressure me for details on these tools or when they will be available. How do you feel about closing down Equipd? What can I say. Equipd has been my "baby" for 2 1/2 years, and while it has absorbed hundreds of hours of time (ok more like thousands), the satisfaction received has been huge. It has been a pleasure to assist brothers and sisters in the all-important ministry work, to make daily life easier for those serving in the foreign language field, and to grow Equipd into such a powerful study tool. The feedback and ongoing encouragement I have received from brothers and sisters around the world have made the tremendous effort worthwhile. So while I could feel sad or disappointed, instead I will focus on the fact that I am making the best decision for my continued relationship with Jehovah and his organisation, and will remember that Equipd fulfilled it's objective and was worth the effort. I hope this page answers any questions you have. I wish existing users all the best with Equipd, and thank you once again for your continued support. Maybe we will work together again in the future!